The 11 Best Places to Celebrate St. Patrick’s Day in Arkansas! Everyone is Irish on St. Patrick’s Day! From wearing green to bagpipe parades, the Irish and the Irish-at-heart have countless ways to celebrate the patron saint of Ireland. So, while you’re deciding which kilt to wear, dying your beer green, and dusting off your “Kiss Me I’m Irish” shirt, take a look at our list of the 11 best places to celebrate St. Patrick’s Day in Arkansas. And may the luck of the Irish be with you! Bridge Street, the World's Shortest Street of Everyday Use, in the Hot Springs National Park is the place to be on March 17! The First Ever World's Shortest St. Patrick's Day Parade features the world-famous kissing of the Arkansas Blarney Stone, the World's Potato on Wheels, and the NFL's Dallas Cowboy cheerleaders. The Irish Cultural Society of Arkansas (ICSA) coordinates this family-friendly service event for residents in the central Little Rock community. After the parade, you should definitely dance a jig over to the grandstand for "Dancing at the Crossroads. This event includes traditional Irish dancing by the O'Donovan School of Irish Dance from North Little Rock and the McCafferty School of Irish Dance from Little Rock, as well as musical performances by marching drum and pipe bands. 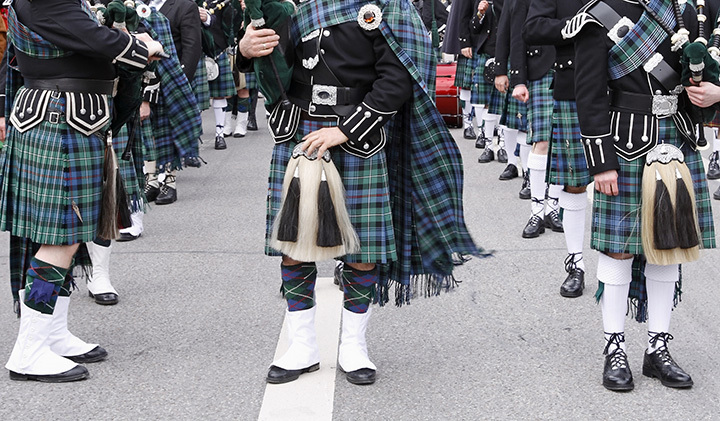 Because he is widely-believed to have been born in Scotland rather than Ireland, this annual festival at Lyon College in Batesville is a great place to celebrate the legacy of St. Patrick. Since it was established in 1981, Lyon College holds one of the United States’ premier Scottish Festivals every April, the Arkansas Scottish Festival. This weekend festival is packed full of piping competitions, dancers, handmade crafts, and delicious food, of course. Anyone wearing green is invited to walk in the annual St. Paddy Day Parade in Eureka Springs! Step on out with the Krewe of Blarney as parade participants paint this historic town green. From Irish Whiskey to bagpipes and beers, the St. Paddy Day Parade in Eureka Springs is a great place to celebrate this March 17! Located inside of Bentonville Ornamental Iron Inc., the Forge Irish Restaurant & Pub offers traditional Irish and New American food. Guests can enjoy Guinness, that famous Irish stout, braised beef in a variety of Irish fare that also includes corned beef and cabbage. “Ceol, Caint Agus Craic” or “food, chat and fun” await you at Little Rock’s own Irish Tavern, your home away from home. Hibernia Irish Tavern features a live, traditional Irish music session every Sunday. Join them on St. Patrick’s Day for a memorable celebration. The annual St. Patrick's Day Celebration in Sidney, which has been going for over six decades, features live music, vintage tractors, food, vendors, parades, contests, and hourly drawings. Contests held on the Baseball Field in Sidney include the St. Patrick's Day Barbeque Contest and the Wild West Chili Contest. The Copper Penny Pub in historic Hot Springs offers Irish pub fare, live music, and nightlife in a traditional Irish pub experience. This relatively new Irish hotspot features an eclectic menu of Irish pub food, including Irish stew, and also hosts an Irish brunch on Sundays. Mickey Finn’s specializes in Irish beer and whiskey and has been a trademark of Dickson Street in Fayetteville for more than 15 years. This small Irish pub style bar is popular among college students in Fayetteville. This three-day festival begins on St. Patrick’s Day as it celebrates the beginning of the springtime season in Southwest Arkansas. The Annual Jonquil Festival is held in the historic Washington State Park where thousands gather to create memories and celebrate springtime tradition.